Sign says: "Almost homeless. Looking for employment"
NEW YORK (CNN) -- Paul Nawrocki says he's beyond the point where he cares about humiliation. Paul Nawrocki, jobless since February, stands on New York corners with a sign announcing his job search. That's why he weekly takes a 90-minute train ride to New York, where he walks the streets wearing a sandwich board that advertises his plight: The former toy-industry executive needs a job. "Almost homeless," reads the sign. "Looking for employment. Very experienced operations and administration manager." 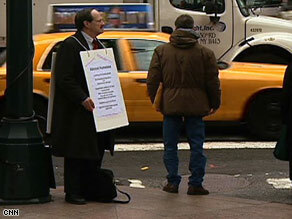 Wearing a suit and tie under the sign, Nawrocki -- who was in the toy industry 36 years before being laid off in February -- stands on Manhattan corners for hours, hoping to pass resumes to interested passers-by. "When you're out of work and you face having nothing -- I mean, having no income -- pride doesn't mean anything," Nawrocki said. "You need to find work. I have to take care of my family." iReport.com: Have you lost your job? Tell us your story. People look but don't often stop. A woman in the jewelry business paused as Nawrocki stood with his sign outside Grand Central Station recently. "I feel sorry for him. I wish I could help him," she said. "I'll pray for him. I'll give him a prayer card." Nawrocki will take the prayers. His wife is partially disabled and on 15 medications, his daughter has student loans, and he's running out of money, he says. He tried more traditional approaches at looking for work, but nothing came through. His daughter eventually suggested handing out résumés on the street. Getting the right person's attention is tough. Competing with him for the eyes of passers-by are charity groups and homeless people seeking donations. But there was one hopeful moment as CNN was interviewing him. A man identifying himself as the head of a New York executive recruiting firm took one of Nawrocki's résumés. The man, Steve Warren, was asked whether employers are looking for people with Nawrocki's expertise. "It's very difficult," Warren said. "The operations pieces are all exported to overseas, and the problem that we face is, guys like Mr. Nawrocki have a problem finding work here." Warren was asked whether someone could find a job using Nawrocki's walking-the-streets tactic. "Well, I found his résumé here, so I'm going to try to find him [something]," he said. Nawrocki has plenty of competition. The U.S. government said 533,000 jobs in the country were lost in November, and more than 1.9 million jobs have been lost in 2008. But he retains hope that he and his sign will attract the right opportunity. "There has got to be a job out there, and hopefully there's one for me," he said.